This ale was brewed on January 7, 2011. 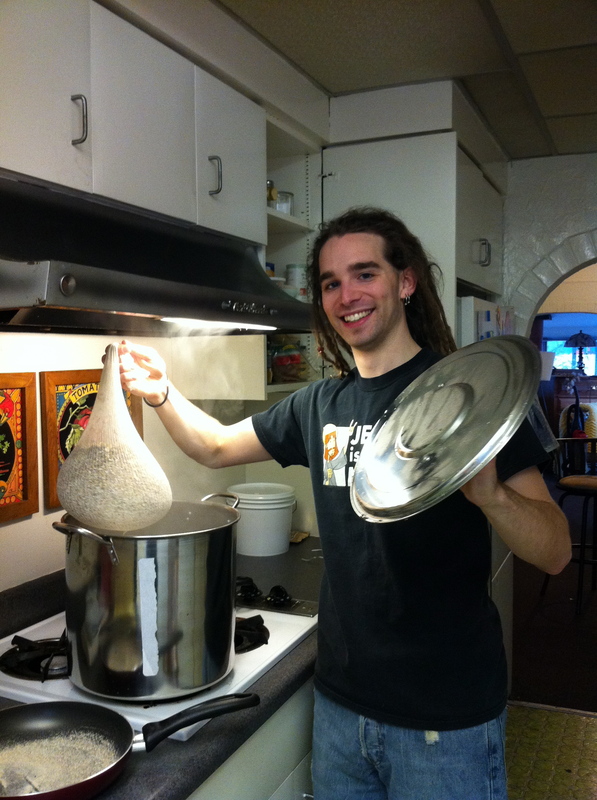 It was my first brew day and took about 5 hours to complete from start to finish, including cleanup. This was a partial mash recipe. The first step was boiling 3 gallons of water in the brew pot. Then, the heat was turned off and 2.5 pounds of grains, in a cheesecloth bag, were immersed in the pot and left to soak, with the lid on, for 45 minutes. 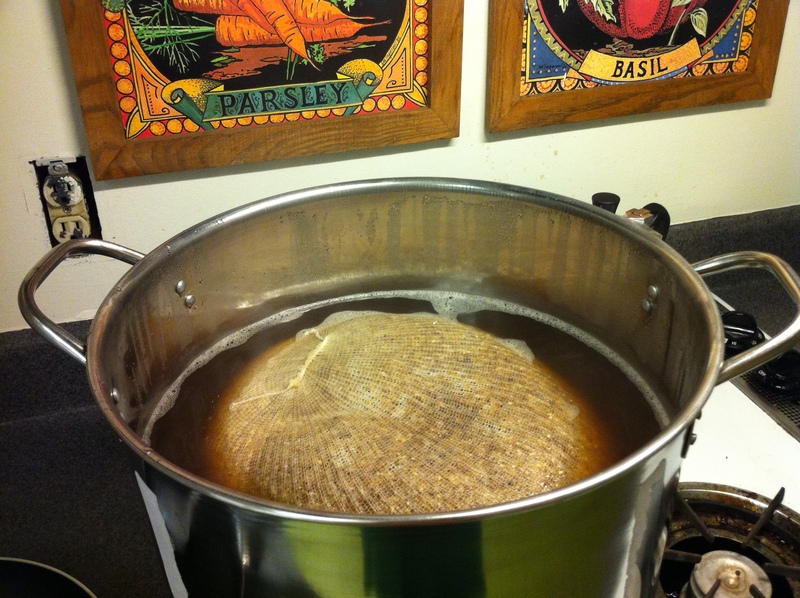 After soaking, the grains were removed and the wort was once again brought to a boil. After reaching a boil for the second time, the heat was turned off and the malt extract was added. Although the recipe specified that the extract should be added while stirring, we didn’t stir the pot until all of the extract was poured. 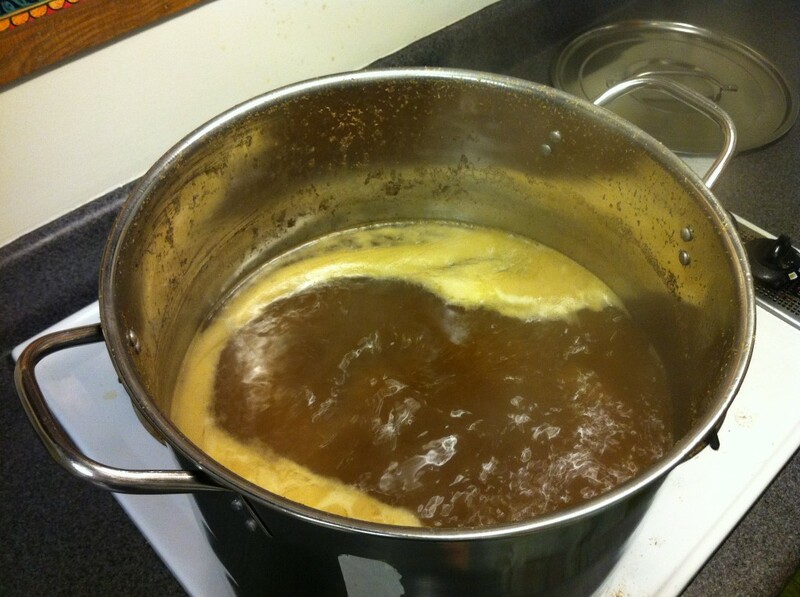 After adding the extract, the wort was brought to a boil for the third time. It boiled for 1 hour and hops were added as per the recipe timesheet. The only concern that arose during this process was that the wort didn’t seem to reach the hot break. The pot was never in danger of boiling over. My best guess is that, with only a single burner on, the wort wasn’t able to be heated to a high enough temperature to reach the hot break. Unfortunately, I didn’t have a thermometer on hand, so I wasn’t able to get any temperature readings. 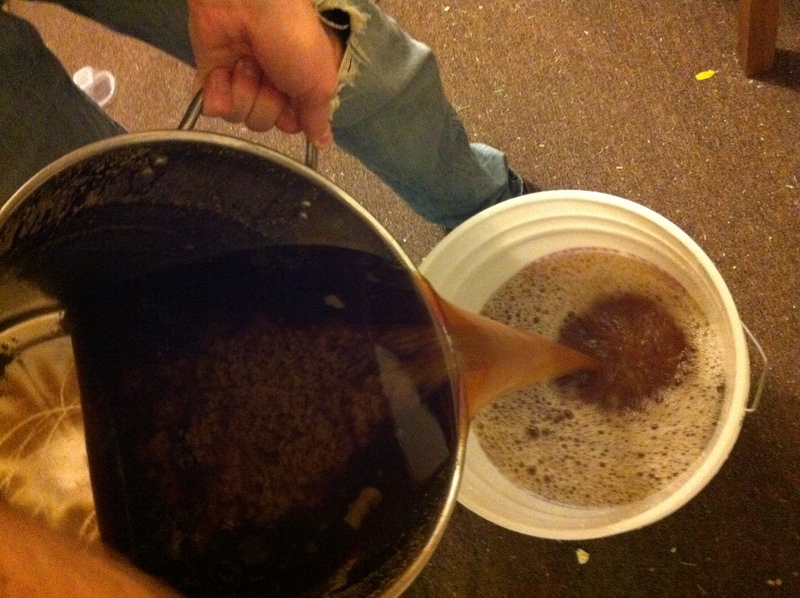 After boiling and cooling the wort, it was ready to be transferred to the primary fermenter. First, 3 gallons of water were added to the fermenter. 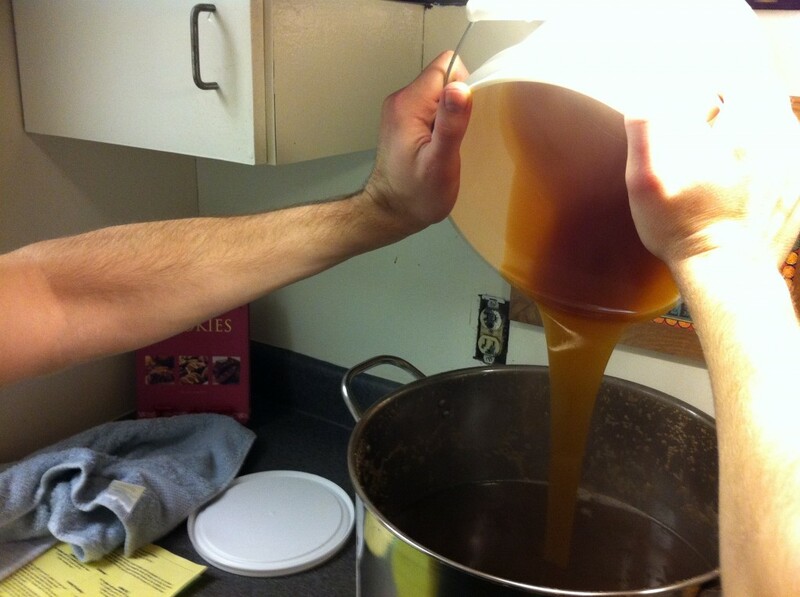 Then the wort was poured in. Finally, the yeast was pitched and the fermenter sealed. The steeped grains were distributed around the trees outside my home. I assumed that there were still nutrients in the grains for the trees and lawn to use, and that putting them outside was less wasteful than into a landfill. I forgot to use a hydrometer to measure the specific gravity of the wort before sealing the fermenter. So, for this batch I won’t know the potential alcohol of the finished product. That’s something I’ll try to correct with the next batch. Also for the next batch, I want to try increasing the heating power available for boiling by using two stove burners at the same time. In the future, I want to be certain that the wort reaches the hot break. I expect fermentation to take about 21 days for this brew. It’ll spend 6 days in the primary and 15 days in the secondary. Until then, we’ll wait patiently to see what it grows up to be. This entry was posted in Brew Diary on 2011-02-25 by Joshua Beeler.